The past few weeks have been devoted to getting my patio ready for spring and summer. I am so close to being finished! I am enjoying our new seating area by the pool every morning with my coffee and a glass of wine in the evening. There's nothing I love more than sitting outside with a great view when the weather is nice. The kids also join us without even having to ask them to grace us with their presence. That's nothing short of a miracle now that they're at the tween/teen age! 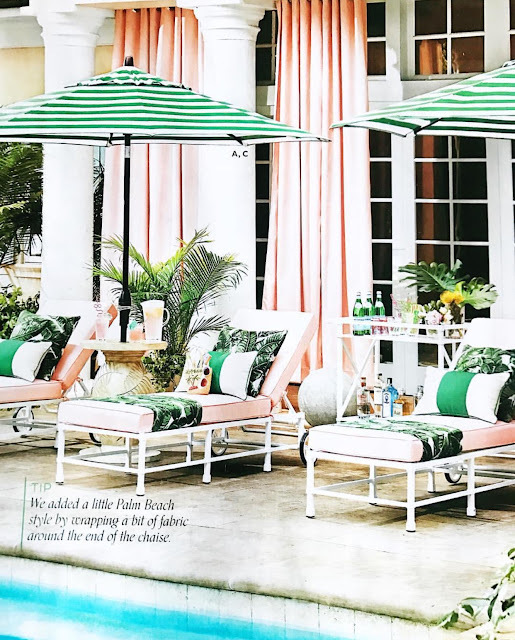 I noticed when shopping online the Palm Beach/Palm Springs look is very popular right now. I just love the mix of bright colors and retro furniture. 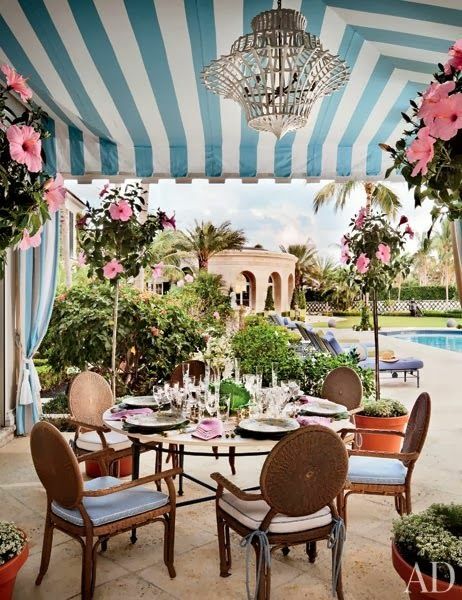 This Palm Beach inspired photo from Ballard Designs is so fun and colorful. The banana leaf print and blush color have come back full force lately. You can always safely invest in striped cushions or umbrellas because they will never go out of style! 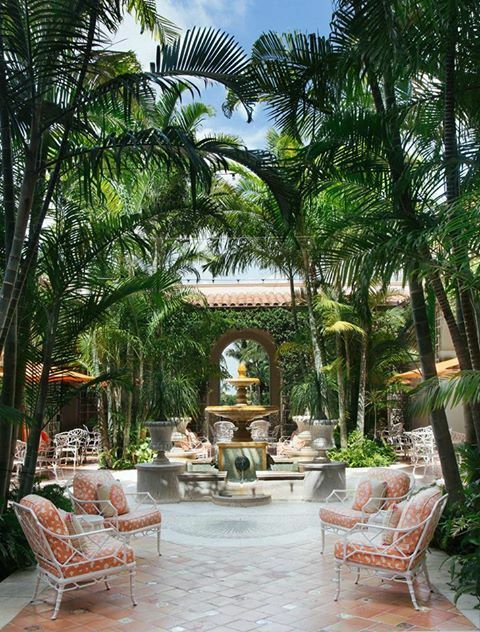 I remember visiting Palm Beach years ago when we lived in Florida. I didn't know much about it at the time since I was younger, but I immediately fell in love with the homes, the ocean and Worth Avenue of course. Lilly Pulitzer is the epitome of Palm Beach style! I just love the new line at Pottery Barn. I always look forward to Frontage's outdoor catalog for inspiration. 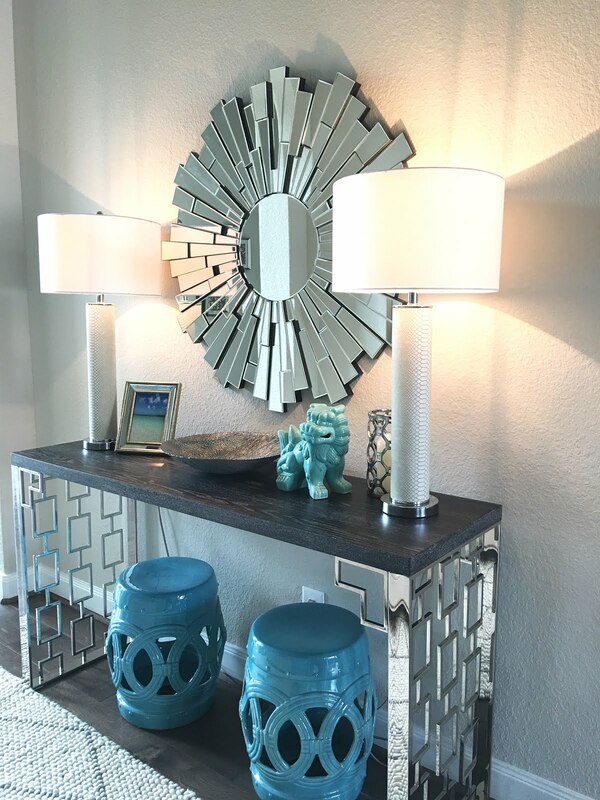 Most of the furniture is out of my price range, but some of the decor items are reasonably priced, especially with their 20-30% off coupons. This Palm Springs look is making me want to jump on a plane and turn on my Frank Sinatra playlist. Actually, I am headed to Palm Springs this summer. We have golfers in my family! The retro hotels and pools could not be more adorable. I absolutely love The Parker Hotel, but it's not feasible to stay there with kids. That doesn't mean we can't visit for lunch! The younger boys will love the lemonade stand. Palm Beach and Palm Springs are very similar in style, aren't they? 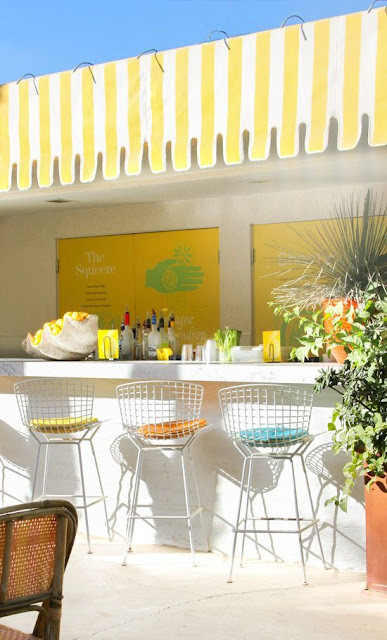 Palm Springs is mid-century modern and Palm Beach is more traditional, but they are both colorful. The takeaway is to look for stripes, brights, pagoda style umbrellas, banana leaf prints and maybe add a flamingo for fun. Don't forget the serving and drink ware for entertaining! Love the look in all the photos you shared. I so regret that I didn't buy striped accent pillows for my outdoor furniture. I actually thought about replacing mine with black and white stripes this year, but I may have to wait awhile longer! Enjoy your patio! Best site, outstanding management, and delightful home furniture. I visited to get my personal table in addition to chairs nevertheless after choosing all of them up We enter the display room and that I fell in love with numerous tables. crp adirondack chairs did something to produce a quick modify also it has been really courteous. Backyard for rich people! 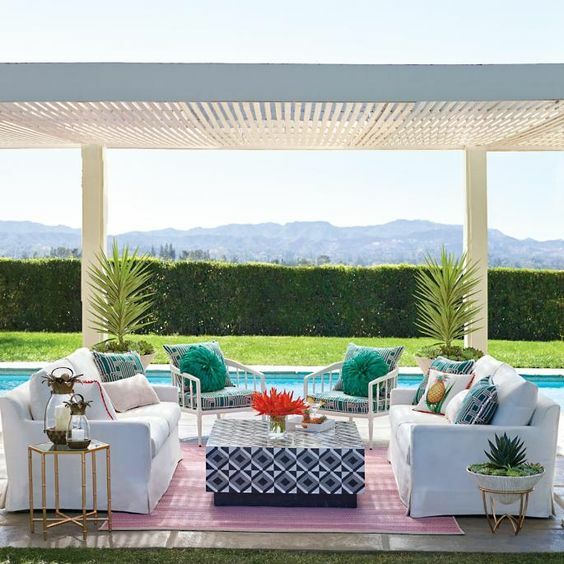 How luxury these patio furniture. The important factor that is the patio series has been put in a great garden. the best way to increase the value of your house. Love it! This is an awesome post! Will continue to check out your upcoming articles. Cheers! I am headed to Palm Springs this summer. We have golfers in my family! 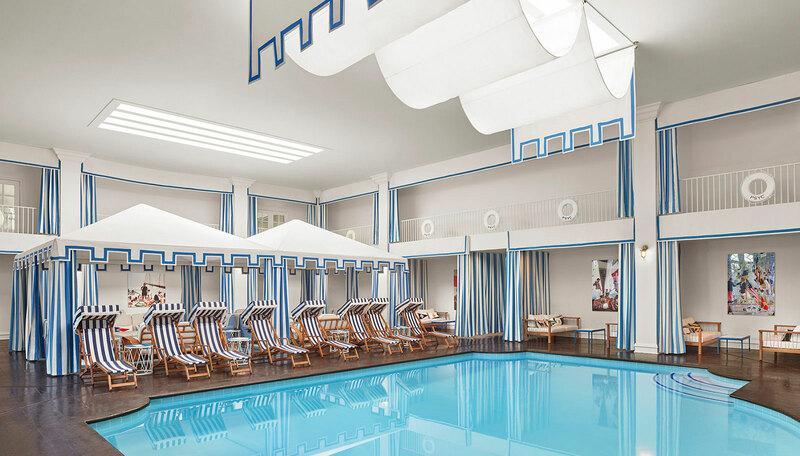 The retro hotels and pools could not be more adorable. I absolutely love The Parker Hotel, but it's not feasible to stay there with kids. That doesn't mean we can't visit for lunch!